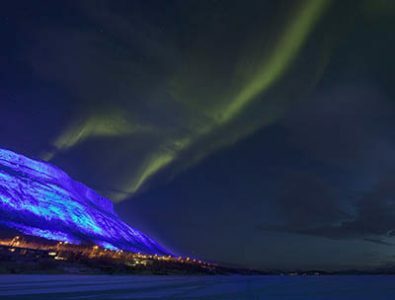 –– For the honor of Finland’s 100 years of indpendence one of the most known fell of Finland, Saana in Kilpisjärvi, was lighted for two days in the beginning of December 2017. I worked there for some photo assingments for the media and had a chance to photograph the fell (small mountain) during my 3 day visit. The fell called Saana was surrounded by 130 led lights among about 4,5 kilometers. It was made possible by Kari Kola from Valoparta Oy. To see some images of it, please go to my archive website here. FIN: Yllä olevasta linkistä voit katsoa valokuvia upeasta Saana-tunturista, joka oli juhlavalaistu 4-5.12.2017 itsenäisyytemme 100-vuotisjuhlan kunniaksi. Juhlavalaistuksen toteutti Valoparta Oy:n Kari Kola.